When drug kingpins do get busted and cops break down the doors of their opulent mansions, it’s a great opportunity for us law-abiding have-nots to gawk at their sweet digs. Filled with luxury goods, fast cars and some stuff that’s downright bizarre, a tour through the homes of drug dealers is a peek into world most of us will never live. There are few drug kingpins bigger than Pablo Escobar. The now-deceased head of the Medellín cartel, Escobar is credited with flooding American streets with cocaine in the 1980s and early 1990s. But when he wasn’t shipping bricks of coke by the ton into the U.S., Escobar was relaxing at Hacienda Nápoles, his ranch located about 200 miles northwest of Bogota, Colombia. Situated on a 7.7 square mile estate, the ranch featured a zoo of rare animals, a bull-fighting ring and life-sized dinosaur statues. He may have been a ruthless and homicidal drug kingpin, but hey, he knew how to have a good time. After his death, the sprawling estate was taken over by the Colombian government, which now manages it as a tourist attraction. Visitors can even take a quick dip in the drug lord’s swimming pool. 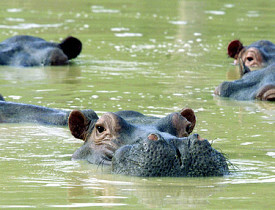 While most of the animals in Escobar’s zoo either died or were taken in by zoos, the hippos have become feral and their population has swollen to 27 from the four Escobar originally bought. These deadly river dwellers continue to menace the wetlands around Escobar’s estate, keeping the kingpin’s fierce legacy alive. Not all drug kingpins make their fortune smuggling high-grade cocaine into the country, or violently hustling crack from street corners. Some employ a far more modern approach. Rakesh Jyoti Saran used his online pharmacy to sell millions of dollar of pills over the Internet, netting as much as $50,000 a day from sales. This Texas-based drug titan’s palatial Arlington home went up on the auction block after he pled guilty. The federal government netted $1.2 million for the 22,000 square foot home, which is now appraised at $3.7 million. Featuring heated marble tiles, five fireplaces, an indoor pool and a custom-painted murals , the mansion sits just a few miles from Cowboys Stadium, making it the perfect abode for the football fan who doesn’t mind its checkered past. Unfortunately, someone in Britain’s Serious Organized Crime Agency had a subscription and got a little curious about how the unemployed Yearsley could afford such a lavish mansion. Featuring a gargantuan indoor swimming pool, handcrafted marble tile work and the sort of luxe home theater you’d expect to find in a Hollywood mansion, the $9.5 million home just outside of Manchester is neighbor to some of the U.K.’s biggest soccer stars. Shortly after, Yearsley was busted for selling more than half a million dollars’ worth of weed to undercover agents. His next home likely won’t be so nice. Pezao was one of Brazil’s more successful drug traffickers. After a massive November 2010 raid on Complexo do Alemao, a notorious Rio slum, Brazillian police found his mansion concealed amongst the squalor. While the massive police offensive turned up a mansions filled with guns and drugs, in Pezao's house, police also found a painting of teen Canadian heartthrob Justin Bieber hanging on the wall. Drug dealers, they’re so like us. Adam Verwymeren is a Networx - http://www.networx.com - writer. Get home & garden ideas like this - http://www.networx.com/article/inside-the-homes-of-three-drug-king-pins - on Networx.com.